Under the best of circumstances, the flu vaccine is only around 50% effective in healthy adults, and just 9% effective in the very group that allegedly needs protection the most, our elderly. Remember that the alleged health benefits of vaccines and vaccinations are just a big lie of the vaccination industry money-making machine. While the American public is being pressured into getting the latest flu vaccine, the data clearly shows that its effectiveness has been a dismal failure. We have been repeatedly told by slick, professional liars that the flu vaccine is effective, yet 3 different studies published earlier this year in Eurosurveillance has documented the exact opposite. First, we were told that 3 different virus strains were selected for this season's flu vaccine. Further, we were led to believe that the flu strains selected for this season's flu vaccine was a good match for the influenza threat facing North America. "Since October 1, 2012, CDC has antigenically characterized 972 influenza viruses, including 66 2009 influenza A (H1N1) viruses, 608 influenza A (H3N2) viruses and 298 influenza B viruses. All 66 of the 2009 influenza A (H1N1) viruses were characterized as A/California/7/2009-like. 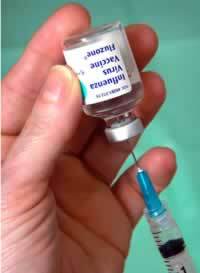 This is the influenza A (H1N1) component of the Northern Hemisphere vaccine for the 2012-2013 season. Of the 608 influenza A (H3N2) viruses, 606 (99.7%) were characterized as A/Victoria/361/2011-like. This is the influenza A (H3N2) component of the Northern Hemisphere influenza vaccine for the 2012-2013 season. Of the 298 influenza B viruses characterized, 70.8% belonged to the B/Yamagata lineage of viruses, and were characterized as B/Wisconsin/1/2010-like, the influenza B component for the 2012-2013 Northern Hemisphere influenza vaccine. The remaining 29.2% of the tested influenza B viruses belonged to the B/Victoria lineage of viruses." -- CDC Info filtered to us by North Carolina H&HS. Of course, more objective reporting of the truth told a completely different story. "The 2012/13 influenza season in North America has shown moderately severe activity, spiking over the December/January holiday period, with influenza A(H3N2) viruses predominating among typed/subtyped viruses to date in both Canada (about 90%) and the United States (US) (about 70%)." "The new report from the Centers for Disease Control and Prevention found the vaccine offered 58 percent protection against the most common and dangerous H3N2 strain for children ages 6 months to 17 years old, 46 percent protection for adults ages 18 to 49, and 50 percent protection for adults 50 to 64 years of age. However, for seniors 65 and older, this year's flu shot was found to be only 9 percent effective against the more virulent H3N2 strain, the report showed. In conclusion: why would anybody risk vaccination safety issues when under the best of circumstances the annual flu vaccination is only around 50% effective in healthy adults, and just 9% effective in the very group that allegedly needs protection the most, our elderly. Other effective natural alternatives to the flu vaccine are available. Our suggested nutritional supplement regiment should enable most adults to at least survive the flu, which is a normal vicissitude of life. Just as obviously, those following our entire health and wellness program would be far better protected against serious and deadly communicable diseases. Annual, ever changing, Flu vaccinations are the weakest link in the vaccination industry's arsenal of vaccines. For conventional medicine to even attempt to develop a vaccine against a virus that mutates as fast as influenza does, is patently absurd. The notion that you can ignore lifestyle factors, eat a horribly bad diet full of junk food, and honestly expect to receive good health at the end of a needle is foolhardy at best. Notice how these slick, professional liars try to trick you into feeling guilty about not getting a flu shot. The claim that getting the flu shot is as important for the community as it is for you by an alleged concept of herd immunity is totally without any basis in science. The claim of herd immunity is nothing but an an open admission, hidden under rhetoric, that vaccinated individuals are NOT protected from getting sick. In other words, it is an admission that vaccinations are nothing but consumer fraud. Do NOT be ticked by the U.S. government's nationwide deceptive advertising campaign to encourage Americans to get vaccinated by their use of fear tactics and misleading information. These slick, professional liars are only interested in boosting the profits of the vaccination industry. This article was originally published on 02/24/2013. Low vaccine effectiveness against influenza A(H3N2) virus among elderly people in Denmark in 2012/13 - a rapid epidemiological and virological assessment. Euro Surveill. 2013 Feb 7;18(6). doi:pii: 20397. Interim estimates of influenza vaccine effectiveness in 2012/13 from Canada s sentinel surveillance network, January 2013. Euro Surveill. 2013 Jan 31;18(5). doi:pii: 20394. Effectiveness of seasonal 2012/13 vaccine in preventing laboratory-confirmed influenza infection in primary care in the United Kingdom: mid-season analysis 2012/13. Euro Surveill. 2013 Jan 31;18(5). doi:pii: 20393.